This study investigates the effects of continuous exposure to a widely used organophosphate pesticide, chlorpyrifos, on survival, growth, development, and activity of larvae of the Asian common toad, Duttaphrynus melanostictus Schneider 1799. Larvae were continuously exposed to six different concentrations (1–1,500 μg l−1) of commercial-grade chlorpyrifos for 14 days and monitored for 1 additional week. Chlorpyrifos at ≥1,000 μg l−1 caused significantly high and dose-dependent mortality, and the weekly LC507 day–21 day values ranged from 3,003 to 462 μg l−1. 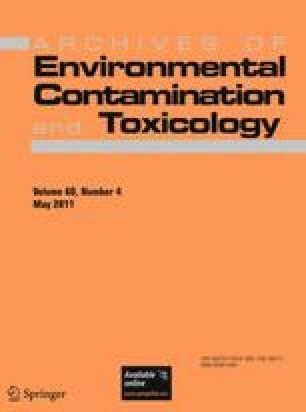 Larvae surviving exposure to ≥500 μg l−1 chlorpyrifos showed significant growth impairment, delays in metamorphosis, and decreased swimming activity. Tail abnormalities were the most common morphologic deformity at concentrations of 1,000 and 1,500 μg l−1 chlorpyrifos. The findings of the present study highlight the need to recognize the potential risk that agrochemicals pose to amphibians inhabiting agricultural landscapes in Sri Lanka and other Asian countries. We are grateful to the Department of Zoology, University of Colombo, for providing funds and necessary facilities to carry out this project and for the technical assistance provided by A. de Silva, J. R. A. C. Jayakody, and S. Abeysinghe of the Department of Zoology, University of Colombo.